Cooking 4 all Seasons: Burger days are here again! Want to have a bite? I am a sucker for junk foods! Well I know by proclaiming myself as junkie of this, might go against many things I want to change. But only thing that's certain in this life is change itself. So I got to accept the change my current life style has to offer. But better part of my 20's I have spent thriving on foods that get classified as Junk or western food. I am not saying western food is junk, only what we got to eat happened to fall in that category. I was always ready for a Pizza, Burger or French fries any time of the day. As if eating out is not enough, I used to cook these a lot at home too. Those days were burger days. Everybody at home used to just love these and I had ultimate fun cooking them up. But marriage brought a big shock, hubby dear is against anything that's considered junk. So that curbed the urge to cook these. Then came kid and generally everything that life brought about was decisive against another try at these precious dishes to heart. But knowing my affinity to these, during my second pregnancy hubby dear ensured I eat all these so that I was happy. The last few days before my due were only pizzas, burgers, Bhel puris vegera vegera! So I was trilled to no end! It's been really long since I had a bite on a delicious Burger. During our burger nights, it used to be just us, while Kutty gets to play in the kids corner as we dig into our stuff. Hubby orders chicken, while I order burgers. Konda gets to eat both. Hubby calls it budger budger and I get so happy hearing that term. So when Konda insisted she wanted burger for dinner, I made frequent trips to the super market to lay my hands on these burger buns. Finally I planned burger for her dinner. I remember how elaborate it used to be, when we decide it to be burgers for dinner. I used to make the cutlets or patties with all vegetables. Now since its for Konda, I just made with onions and potatoes. Whatever is added with the cheese and sauce, its yummy! So here come the classic burger, you won't want to look elsewhere! Before are listed and needed as required. Heat a pan with butter, add flour and fry well. Add salt, slowly add milk. Stir well for it to mix properly and let it come to boil. Once it comes to boil, add pepper and adjust milk to get a think sauce. This version of patties is shallow fried and easy to make. Boil the vegetable and remove to a bowl. Add julienne onions, grated cheese, garam masala, pepper, some bread crumbs. Divide to equal portions. Flatten to circles in your palm. In a cup, take corn flour and mix water to get a liquid consistency. Alternatively you can coat the patties in flour and then coat with the cornflour and finally with bread crumbs or rusks. I didn't have rusks, so ran two bread slices in mixie to get a powdered bread and coated the final patties in that. Heat a shallow pan with little oil, once its hot place the patties and sprinkle little oil on top. Adjust the flame and ensure its cooked evenly. Since everything is cooked, you will not need much time with this. Slice the burger bun in the middle, you can either completely cut it off or you can make a cut in the middle so that you just get a gap to fill in middle. But mostly slicing it completely works out better. Apply the white sauce on both the sliced buns. On the bottom slice, place the cheese slice, then all the rings. 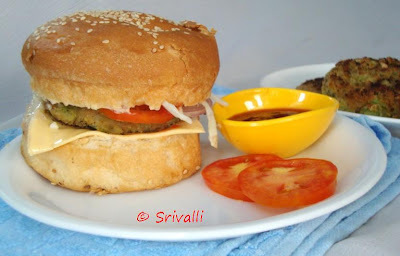 Then top with a patty, finally you can top with another layer of vegetables or Cheese slice. Add little tomato sauce between the layers if required. 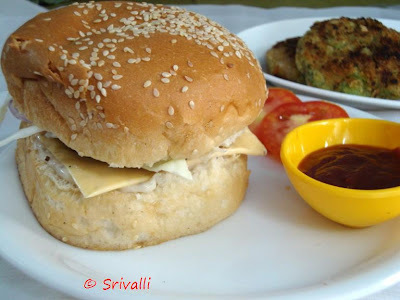 If you want more spice to the patties, add chilli powder or chopped green chillies. Everything is left to your imagination. Serve with Tomato sauce and its ultimate comfort food for me. Hubby dear was doubtful if Konda would be able to bite in but she proved she could, by taking a big mouthful and was delighted with that!